Cliffe FC continued their pre-season preparations on Tuesday evening. They travelled to face, Leeds 1st Division, Collingham where ultimately the home side won the game 1-0. On the blustery Tuesday evening, little goal-mouth action happened within the first half and at half-time the score read 0-0. The second-half saw both teams strive to open scoring and Nathan Parker came close for Cliffe with a header, Scott Birch had a shot cleared off the line and Ian Beckram, during a token appearance, had a long range effort clear the bar. 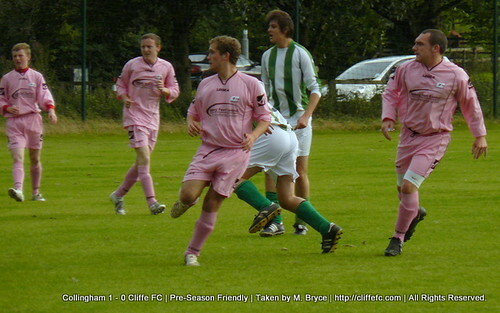 It would be Collingham that would score the first and only goal of the game and the game finished 1-0 to the home side. Both sets of players played this match in great spirit and Collingham’s manager openly acknowledged that a draw would have been the fair result.